Modern slots are very similar to those produced by Charles Fey, however, they have a range of deviations as far as modern manufacturing made modern slots design the most suitable and easy in exploitation. The gamer playing slots should first buy the right to participate in the gambling with the help of the coin insertion, cash, or in the most up to date Ticket-in or Ticket-out machines by means of the special paper ticket with barcode for particular slot machine in the house. Traditionally the machine can be activated using a button, lever or on innovative machines even with the help of pressing the sensor touch screen on its surface. Traditionally the target of the slots gambling is the winning of money from the machine. Traditional game involves matching the symbols depicted on the spinning slot machine reels. No matter, what kind of reels - mechanical spinning reels or simulated digital reels shown on the video screen must be matched for the repay to be conducted. All symbols are eye-catching and easily recognizable like fruit images, letters or various numerals, simple shapes like bells, hearts, diamonds, The newest slots dispose the animated features like pop actors, singers, cartoon images, etc. The majority of slots have various winning combinations. For example, USA slots, particularly in Las Vegas, may be of various types: from reel slots, straight, etc., to progressive slots or video and multi-linear slot machines. One of the main differences in slots design between the reel type slots and, for instance, video slots is the way the repayment calculation is conducted. In the reel type slots the way to win the maximum jackpot is to game the maximum coin amount. Unlike this, the payout value is fixed and is multiplied by the amount of the coins per each line that was bet in video machines. In general, it is an advantage in the reel slots for the gamer to play with the maximum number of the coins. 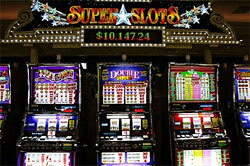 In the recent years the so called multi denomination slot machines were introduced. They allow the gamer to choose the stake (value of each wagered credit) from the option list. Thus, based on the choice of the gamer, slots automatically calculate the slots machine number. One more innovation is the fact that more and more casinos adopt the tokenization concept. According to it, the token can buy more than one credit and the houses can easily configure slots of the numerous various denominations yet to accept the same very type of token.